Gold plated medallion also available in silver, brass and copper. Various sizes from 30mm-70mm available with or without antique finish and colour paint fill. They can be made as single or double sided. 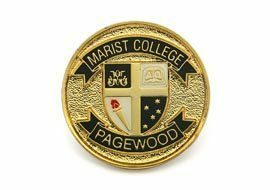 Medallions can be individually engraved with names or numbers and can also be supplied with presentations boxes, ribbons or lanyards.